There I was stood in the center of the 1980s Afghanistan, with only my trusty Dog as company, scouting out a guard outpost for the prisoner I needed to extract. Oh sorry. Wrong game. I’m supposed to be talking about Final Fantasy aren’t I? The trouble with setting myself a challenge like this so late into the year is that it was so easy to forget just how many exciting games are on the way before 2016. Most notably Metal Gear Solid V: The Phantom Pain which has dominated my evenings for the last 2 weeks. It’s a mammoth game and I’ve spent near on every waking moment thinking about it. Nearly 40 hours in, it’s mad that I’ve found any time to make progress in another game, but the very first FF game has managed to steal me away for a good few hours too. I say steal me away, when it has actually been quite a chore to make it 8 hours into the game that started it all. It’s a hard slog, with very little structure and even less story, but it’s a game that I feel ashamed not to have beaten. I’ll probably go into more detail with just how empty most of Final Fantasy is when I eventually complete it, but early on it really is a bland experience. I’d like to say my character names were original, but I can’t. If I’d attempted this play through without a guide of some sort, I’d still be in the opening area even now. The PSP version I’m playing does have some additional hints in the form of a dancer character in the opening town, but when these hints include ‘Nerrick is looking for Nitro Powder’ when you have no clue who Nerrick is or where you’d start to look for Nitro Powder it’s near impossible. Something I’ll probably have to continue when I make it round to FFII, I wouldn’t have a chance at this task without walkthroughs. Choosing my team at the start was probably the most important reason that 8 hours in I still haven’t escaped from or been defeated in a single battle. 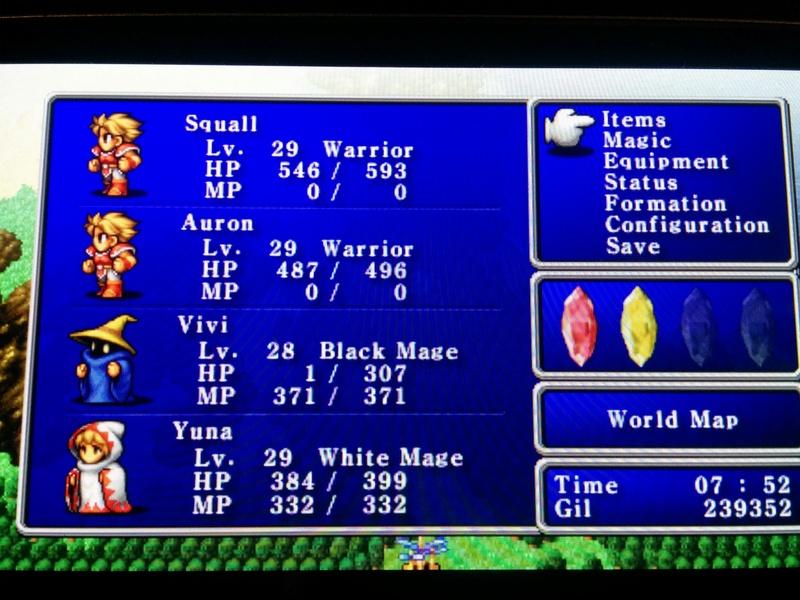 The Warrior, Warrior, Black Mage, White Mage lineup is one that plays to my strengths as an RPG fan. The fact I’ve named said characters Squall, Auron, Vivi and Yuna speaks more to my favourite characters in the series. I wouldn’t be surprised if I even manage to make it to the final boss without losing a single battle, though of course now I’ve said that it’ll never happen. 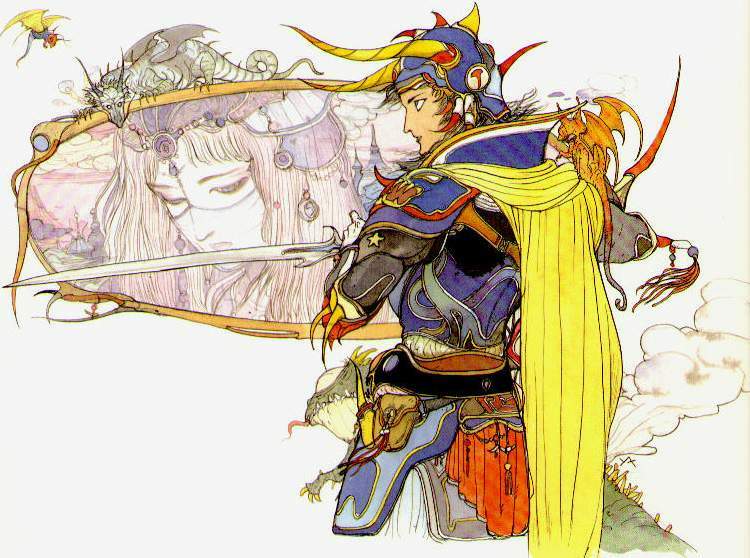 The main thing I feel has changed since I completed FFV is that I think I could actually complete the rest of the games before the end of the year. It feels achievable, which is surprising at this early stage. Maybe things will change once I go back to the second entry in the series, but for now I’m feeling unnervingly confident. Tags: Final Fantasy, PSP, The Final Fantasy. Bookmark the permalink.